I thank you very much for the StylePix.It is a very nice and cool image editor. I was using Photoshop already and at now i use Gimp.when i found stylepix, i liked it and i've started to use it. I am a persian and my language is farsi(like arabic). I attached a picture that show this problem. Is a way to solve this Problem? 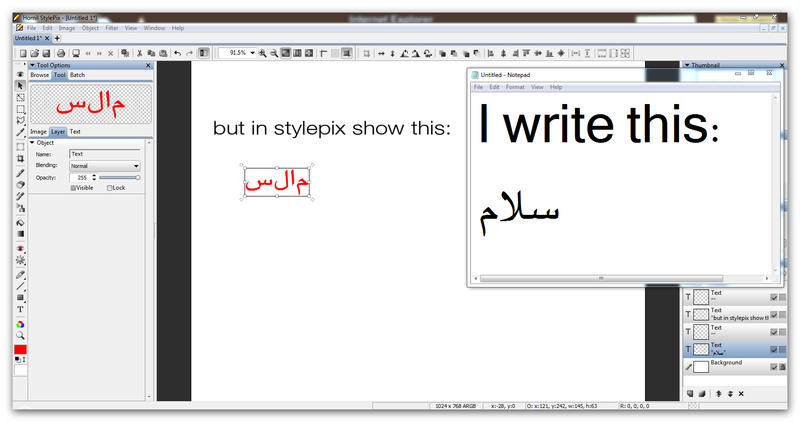 Currently Hornil StylePix doesn't support arabic and farsi. But don't be too discouraged. We have a plan to support arabic or farsi languages, but don't have a firm date yet. Currently Hornil StylePix doesn't support arabic and farsi. But don't be too discouraged. We have a plan to support arabic or farsi languages, but don't have a firm date yet. Thanks. Thank you.i wait for this version. This feature will be added in next version. hello..really great post..very informative and useful..thanks for sharing this.. The professional Prestige Packers and Movers Thane will provide you written assurance for on-time delivery of goods to the target destination, and in the case of delay, you can claim the loss from the movers. However an expert moving contractor will not give you the opportunity to complain but due to obstacles such as road traffic, signals, and weather, the time of delivery may change slightly.